This Brooder Hen is ideal for brooding up to 20 chicks at a time. 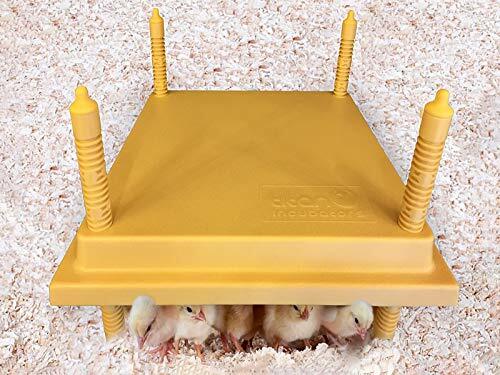 The flat design of the heating element maximises surface area, allowing as many chicks as possible to keep warm at the same time. Easy to set up and use - great for beginners or brooding experts. Ideal for use with poultry and waterfowl chicks. The legs are fully adjustable for height, meaning the Brooder Hen can grow as your chicks do! You can also use our Brooder Hen to provide underfloor heat for parrot-type birds by inverting the heating plate. Please note: as a result of Titan Incubators' new unique heating method and diffuser plate, it may take 30-60 minutes for the plate to heat up fully after being turned on. What's included: 1 x Brooder Hen, 4 x Easy adjustable legs. Use with up to 20 chicks at a time! Simple and easy to clean. View More In Poultry Habitat Supplies. If you have any questions about this product by Titan Incubators, contact us by completing and submitting the form below. If you are looking for a specif part number, please include it with your message.